Log into your account dashboard and select services. 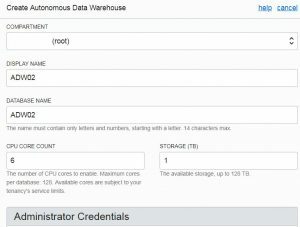 Scroll down and select to Autonomous Data Warehouse. Now check if the correct compartment on the left is selected. A compartment is a logical container used to organize and isolate cloud resources. Compartments are global and logical while physical containers belong to regions and availability domains. Then proceed and click the blue button to create a new instance. Now configure the details of the service. The upper part contains the details about naming the service and sizing it. Default values for CPU Core count and storage are currently one core and 1 TB. The service gets provisioned now is available after a few minutes. The ADW page looks like the following screenshot after one day. ADW creates backups automatically. 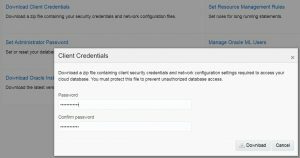 The client credentials are needed to connect to the service by using tools like sqlplus. Click on “Service Console.” A new window will come up. 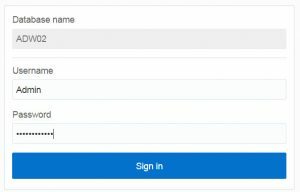 The admin credentials defined above need to be entered now. The next two images show the Overview page and the Activity page. 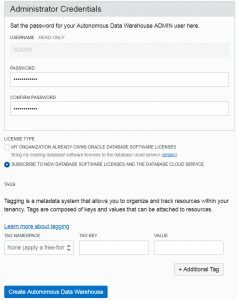 The Administration page lets you download client credentials to connect with tools like sqlplus or SQL Developer. Click to download the client credentials. 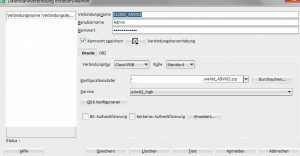 A window will come up for the admin password. Finally, start SQL Developer and configure the connection to the ADW instance. SQL Developer uses the zip file. There is no unzipping necessary. Connection type is Cloud-PDB. Now you are ready to connect. 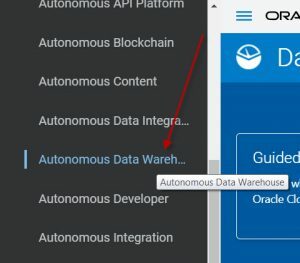 The blog Managing Autonomous Data Warehouse Using oci-curl describes how to create and manage an Autonomous Data Warehouse (ADW) instance using REST APIs.